I close the sliding glass door, and Bridget sparks incense. We don’t like the smell of cigarettes. They disgust us. The new guy who moved in downstairs with the three-legged dog, he smokes cancer sticks, and all his ephemeral friends do the same. They laugh on the ground-floor balcony, directly beneath ours, every night of the week. He’s a college student, a sophomore at St. Edward’s, a mindless Mohawk who doesn’t think twice about hanging a gigantic Texas flag in his kitchen because in his kitchen he wants to think about Texas. ...this Sunday I reread what I’ve written up until tater tots, and I was extremely disappointed with everything about my writing, which is mediocre at best, and abso­lutely uninteresting, and stunningly tiring, and boring, and not at all a reason to write but a reason to change every­thing about my life and the way I spend my time. 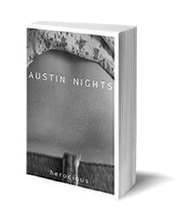 The strange thing about Austin Nights is that it is interest­ing—up to a point. Comparisons with On the Road are perhaps inescapable, and at one point Michael and Bridget even visit Jack Kerouac’s last house, in St. Petersburg, Florida. But don’t expect any road stories about drunken orgies or Mexican pros­titutes here—the closest thing would be various odd and per­haps mentally ill individuals that cross the couple’s path (in the library, a man looking like a deranged leprechaun leers at Bridget, while another puts a sheet over his head while he’s typing his password). My own favorite passages are the ones where Michael recounts his epic battle to make Honeyed Cat diurnal, and so prevent her from waking him at night to go on the balcony. This is a quiet book, about two fairly ordinary people on an ordinary adventure. In a sense, Austin Nights isn’t about journeys at all, but about settling in. If there is a certain sense of romance lacking in the quotidian drama of moving to a new town, it is made up for by a strong dose of honesty. Putting the book down, I couldn’t help wishing Davidson well, and thank­ing him for this glimpse into his private life.